For twenty four years prior to 1811 James Steele had been a stalwart of the Methodist Society at Tunstall. He was a Class Leader and Local Preacher, Superintendent of the Sunday School for 12 years, a Trustee and Chapel Steward. On Christmas Day 1804 he had played a leading role in the lovefeast held at Harriseahead, near Mow Cop. This meeting had a profound effect. Hugh Bourne in his Journal describes a transition of the Tunstall society into ‘Revivalists’. Amongst those who found faith at that time were William Clowes, Thomas Woodnorth, James Nixon, and William Morris. Clowes and Nixon became members of the class led by James Steele. The Camp Meeting movement that developed over the following years did not find favour with the Wesleyans. Following the expulsion of Hugh Bourne (June 1808) and William Clowes (June 1810), a group of people gathered together regularly for worship in the kitchen of Mr John Smith, which had become licensed for worship in 1808. They became known as Clowesites. On Good Friday 1811, William Clowes led a lovefeast in the kitchen. James Steele was a cousin of Mr Smith and also his bailiff. Due to the age of Mr Smith, he often led family worship in the kitchen. Feelings in Tunstall about the Clowesites were running high and it was alleged that James Steele had been involved in the lovefeast service on Good Friday. In April 1811, James Steele was expelled from the Wesleyan Society for being involved in the worship at Mr Smith’s kitchen. This was greeted with despair by many members of James Steele’s classes and members of the Sunday School and many left the Wesleyan movement in sympathy with James. It immediately became clear that the kitchen could no longer accommodate all those who wished to worship with James Steele and William Clowes. Mr John Boden offered use of a warehouse to allow Worship and Sunday School to continue. It was decided to build a new chapel in Tunstall. Work began in May 1811 and the building was opened for worship on 13 July 1811 by James Crawfoot. It is clear that many of the early Primitive Methodist founders got their hands dirty in building the new chapel. In May 1811, the founders of Primitive Methodism decided to formally develop a new denomination, although it wasn’t until 1812 that they became known as Primitive Methodists. Eight societies around Tunstall came together to form the first circuit. William Clowes and James Crawfoot were commissioned as the first travelling preachers with a stipend. Hugh Bourne continued to travel at his own expense. 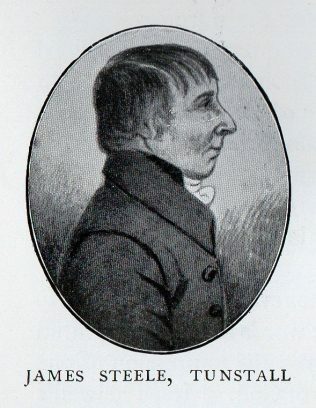 James Steele was appointed the first Circuit Steward with responsibility for ensuring that monies were received from societies to pay the preachers. James died on 8 May 1827 a few days before the 1827 Conference held at Jersey St, Manchester. Hugh Bourne and Thomas King spoke about James Steele in an In Memoriam service held at Conference. William Clowes would have spoken but was himself in poor health. The announcement of his death records that both Hugh Bourne and William Clowes visited him on the day that he died. This page was modified on 2 August 2017 to add a transcription of an article in the Primitive Methodist Magazine, 1903, that provides a fuller biography of James Steele and his influence in the early days of the Primitive Methodist Movement. The sketch names his wife as Mary Alsager, who died in 1821. Their eldest son, John was born in 1794, and another son, Thomas, is named. Unfortunately the deeds don’t even mention the date the house was built. It wasn’t a chapel but was apparently a farmhouse for some years. Thanks for your question? Norfolk was a ‘stronghold’ of Primitive Methodism, so it is quite likely that the builder of your house could have been a Primitive Methodist. It is very unlikely that Clowes and Bourne themselves would have been involved in the building; more likely that they were being remembered in the naming if the property. Have you looked back in the deeds of the property to see when it was built? They may also give you information about the first owner that could be tied back to the Primitive Methodists. Is there a possibility that the house was originally registered for worship, before a chapel was built? Many early Primitive Methodist Societies worshipped in cottages before they could build a chapel. If you Google ‘find the history of my house uk’ you will get some guidance on how to investigate the history of a property. I am a direct descendant of James Steele, our family tree is very exstensive and he is there as my Great-great-great-great-great Grandfather. He is still held in great respect within my family and he always will for the work that he did and for being the person he was! A wonderful article, thank you!